On developing media platforms that are user-centered – open and adaptable to the user's needs and desires – and that earn profit from the value they create for users ...and as tools for augmenting human intellect and enlightened democracy. Showrooming has become a major scourge of bricks-and-mortar retail, but maybe it is the way to a new golden age. I suggest that showrooming can become a major source of profit, and can enable retail businesses to fully exploit the value of showrooms in our experience economy. Brick-and-mortar stores like Best Buy and Walmart are struggling as e-tailers like Amazon and many others are stealing their lunch with more efficient channels and lower prices. Adding insult to injury, they are losing increasing portions of business to the practice of "showrooming," where a customer comes into a store to view merchandise, checks for better prices online, and then buys from Amazon or others. Services like Amazon's Price Check app have become popular to facilitate just that. It is reported that 60% of Best Buy customers use thier smartphones to comparison shop. Faced with this serious challenge, the reaction of retailers has been to try to impede it. The main response has been to increasingly customize products so that they cannot be found and compared online, having manufacturers create SKUs that exist only for them (whether name brand or private label). Oher counters are more dynamic pricing and price-match offers. What if showrooming activity could be tracked, and e-tailers convinced to pay a "showroom fee" to the provider of a showrooming service, if the sale came from that showroom? What if the retailer could filter Internet traffic from their store, and trace which URLs are for competitors, track purchase transactions that emanate from the store, and pass through only those that go to retailers that agree to pay the fee? There are a number of ways this can be done, and that can lead to a new retail ecology that benefits all. Showrooming has great economic value. It enabled customers to see, feel, and try products. That has been a serious limitation of e-commerce, and has been exploited by those who recognize the value of show, like Apple. Now Samsung is working with Best Buy to do that as well. But this has been on a closed basis, for single brands. How could showrooming fees be obtained? One method that seems promising is for retailers to place microcells in their stores to carry cellular traffic, and work with the carriers to track and monitor the traffic, and seek agreements with electronic competitors to pay a fee in exchange for the showrooming service. This might be done through independent parties that ensure privacy, aid in the negotiations, and address any legal issues that may be involved (such as the wireless carriers, or specialized third parties). Sellers that refuse to pay such fees might be blocked. (This can be done using some combination of blacklists and whitelists. A microcell alone might not eliminate all uncontrolled mobile access, but, if necessary stores might use shielding to prevent that.) While blocking traffic may have legal ramifications, if it is done for such valid economic reasons, and in a way that ensures passage of non-commercial messaging, waivers might be sought as necessary. Mobile carriers might find this a desirable way to obtain new revenues. Offering free WiFi service would provide a similar way to filter and track such traffic--and to introduce related in-store messaging services as well. Even without any limits to cellular access, this might provide a value-added service channel, and do the job well enough, in simpler manner. Offering comparative shopping tools that are showroom-fee-compliant and given favored treatment might be a way to get get customers to facilitate such a process without need to filter all mobile traffic. This could also be facilitated via loaner mobile devices or in-store kiosks. An even higher touch service might be achieved with personal shopper programs. The personal shopper might facilitate the online sale with partners that cooperate. If we open our eyes to the positive side of showrooming, this can lead to a virtuous value cycle for all. Customers can experience the items, know exactly what they are getting, and order with less likelihood of returns, reducing costs to the electronic retailer. Cooperating retailers can get featured access and be more likely to be found. Correct identification of products can be facilitated (reducing return costs and increasing satisfaction). Instead of spending money creating inefficiencies just to prevent showrooming, those costs can be eliminated. Fees can be negotiated based on the level of showrooming services offered, ranging from a boxed item on a shelf, to play with the item, to guided demonstratins and advice by sales staff and full personal shopper services. With greater probability of compensation from both direct sales and showroomed sales, physical retailers can spend more to make their showrooms into rich and valuable customer experiences. Showrooms might even emerge as free-standing businesses--sort of an experiential shopping Disneyland--with all sales and fulfilment done by an open market of electronic retailers. By passing some sales to electronic counterparties, the physical retailer finds real offsetting savings by eliminating need for much of their inventory and eliminating returns. By cutting these costs, showrooming fees need not be equal to the full in-house sales margin. The various elements, costs, and benefits of the retail supply chain and service ecology can be deconstructed, and broken into elements that can be costed and charged for individually, and handled by whatever party is most capable of doing it in a way the is efficient and serves all. This can cover the range from marketing, selection guidance, demos, sales transactions, fulfillment, service and support. Best Buy might even swap inventory for pickups of Amazon sales, with bulk replenishment by Amazon. It might also facilitate blurring boundaries between sales and subscription services. There is great economic value to a rich showroom experience. We see that in many department and specialty stores, in Apple stores, and in The Samsumg Experience stores. People like to kick the tires, see the alternatives in real space, talk to sales people face to face, and have a fun family or social experience. What is the sense of a business ecology that pushes bricks-and-mortar retail toward commoditization and increasing friction? Why not find a way for complementary players to work together? Ideas in bottles. This is one of what may become a series, publishing some of my inventions without any effort to seek a patent. Just putting the idea in a bottle, throwing it into the Internet sea, and seeing where it floats, for whoever wants to apply it. Of course this post just skims the surface, and patent opportunities remain in the details (such as filtering and payment/settlement systems) for those with the inclination to develop them (and at some point I might decide to jump in myself). Creating such an ecosystem will not be easy, but I think there is very great potential here. I would be happy to collaborate with those who might pursue this. Solving the revenue crisis for digital offerings -- Since 2010, much of my activity has been focused on developing FairPay, a radically new approach to the critical question of whether and how much people should pay for digital content and services. I believe FairPay will create a new economics that enables far more efficient and broad reaching value exchange in our networked economy. 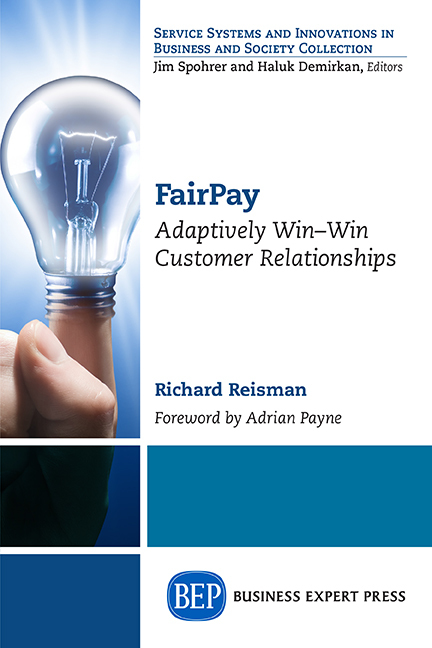 Please check out The FairPay Zone, and this Overview - or my new book. In the War on Fake News, All of Us are Soldiers, Already! This worldview is with homage to the visions of Bush (Vannevar), Licklider, Engelbart, Nelson, and Turoff that drove this continuing arc of development (and with thanks to my professor, Andy van Dam). Filtering for Serendipity -- Extremism, "Filter Bubbles" and "Surprising Validators"
The Necessity of Steve Jobs: ...Inventor? ...or Necessitor?